Yesterday morning the fog covered the hills above the village like a cupped hand. Everything was a bit muted, even the birds seemed to be humming under their wings. 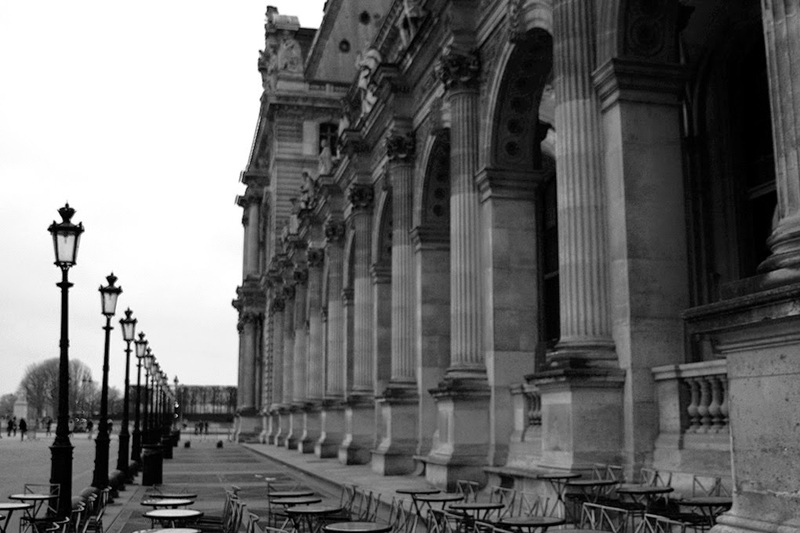 It took me back to my few hours roaming through Paris not so long ago. For then too it was a gray day but my heart began pumping it with color so that I was painting outside the lines. You see, I had a friend to meet. Isn't it something...an anticipation that builds until it whirls like a carrousel? ...and that meant taking in not one but two art exhibitions in the space of nearly as many hours. 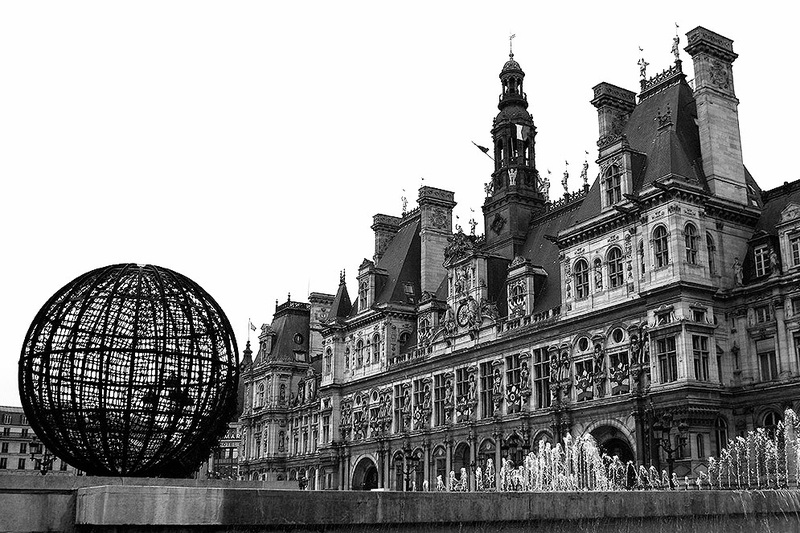 It was exceptional to see the City of Light as loved by the photographers of the Magnum collective. So many of the city's most classic moments were captured and defined by photographers such as Henri Cartier-Bresson that I felt floating free in a past where I felt I belonged despite having never been. 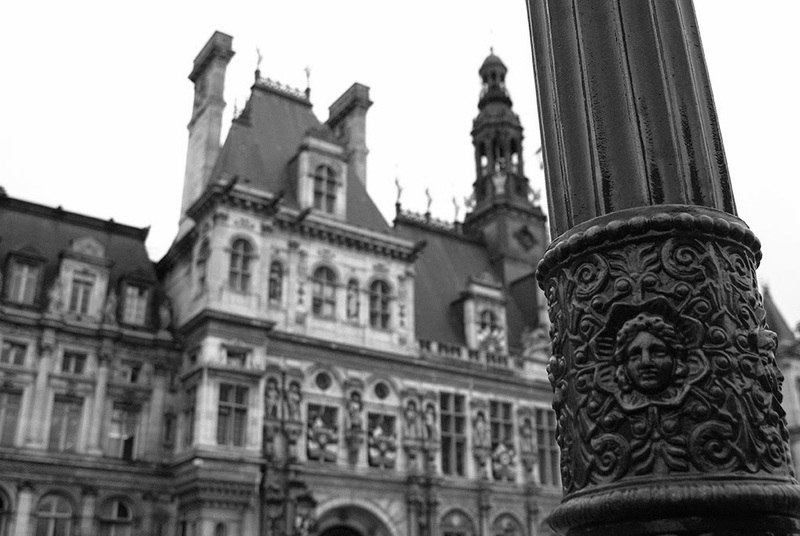 It was a bit of time out of time until I stepped outside the Hotel de Ville and was reminded of recent events that had shocked the world, putting me smack back into 2015. ...or Audrey Hepburn joyously shouting "Take the picture! Take the picture!" while floating past The Winged Victory of Samothrace at the Louvre. Is this why we love Paris? It is the host to so many of our stories - the imaginary, the real or those dancing in-between. All we have to do is somehow place ourselves in that unique landscape, put a finger to the wind and pull on the blur. As the night shrouded Paris in the fogs opposite, I boarded the train for Provence. The doors to the TGV slid together, shutting sound and the wheels rolled out until I couldn't hear them anymore. I took my camera out of my bag and set it in my lap. It held my story - or at least what it had been for those few hours. My cheek felt cool against the window as the bright lights dissolved. Paris was letting me go. "Au revoir," I whispered. Until we meet again. Lived there for five years; left nine, can it really be nine, years ago. Your photo essay reminded me of so much that I hadn't really forgotten. Oh I am so excited for you Bill! I know how long you have been looking forward to this moment...enjoy!! Beautiful photos and words and everything :) You have captured the essence of your trip [erfectly. Ah, the Winged Victory of Samothrace - I do not think there is another sculpture quite as perfect and beautiful even if it is headless now. The new director of the Louvre has changed the way she is presented a bit...I would love to see her in person again! 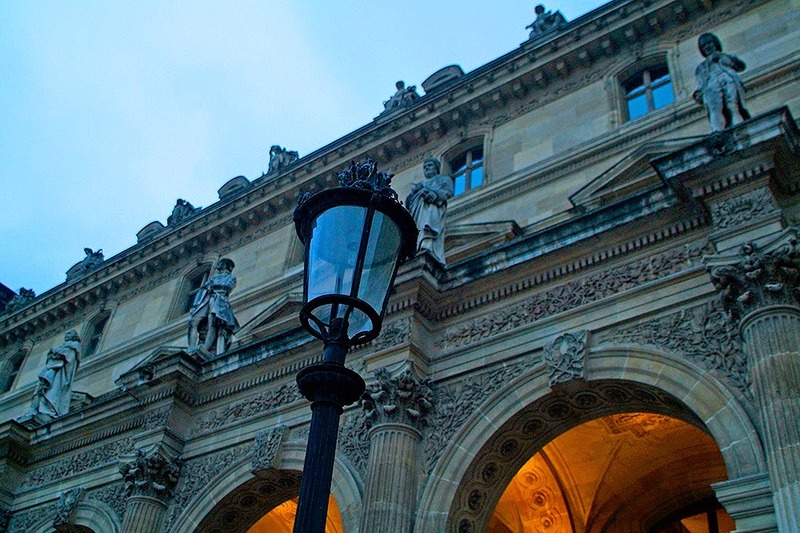 Thank you for these beautiful pictures of Paris – I needed that. I am French and was brought up in Paris but now live too far away. When I get depressed I try to find pictures of my home town and am pleased to have found your post. Merci beaucoup, cela m’a remonté le moral – un peu. Perhaps I too felt a part of the trip even if I was not present!!!! WE BOTH SHALL RETURN...............TOGETHER perhaps! Can you imagine?!? And with Ellie that would make a perfect trio! You have made me "feel" this visit, Heather. Vicki did this the other day with her NYC post. Maybe the wanderer in me needs more of a free hand to roam freely. Let's see, just came back from Hawaii & Montana, but they are not Europe, not even New York. Yep, I'm thinking of taking off in June, maybe a cruise of the Med as I've never done one. However, your train has made me think how much closer we are riding the rails. Lovely! What a word picture! Ah - Heather - you tease us all!!! Such a fantastic city to be even as close as you are to enjoy and visit occasionally would be fantastic - watch out you don't trigger a major migration!! Wyn, a lot of people in Provence do go up a few times a year just to do shopping and see the art shows but it is a case of "so close and yet so far" for me as it is a pricey venture. As I mentioned in my first post of this series, I have the amazing Elizabeth Kirkpatrick to thank for sponsoring my trip to meet Ellie, otherwise I would not have been able to go! Your photo essay reveals the fine facets of Paris, “host to so many of our stories - the imaginary, the real or those dancing in-between.” Little by little I’m seeing Paris. 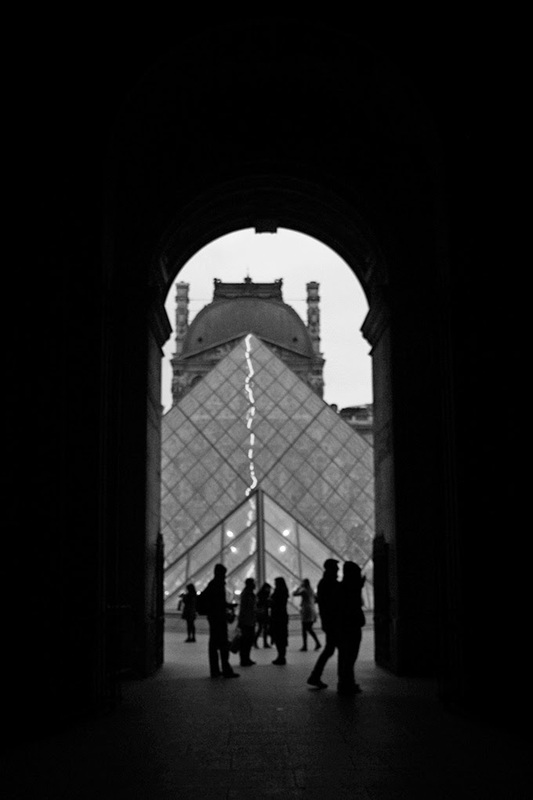 The Paris Magnum photography exhibits, black and white photos, and that colorful Eiffel Towers miniatures, Simone de Beauvoir & younger Picasso, show the versatility of the different photographers. 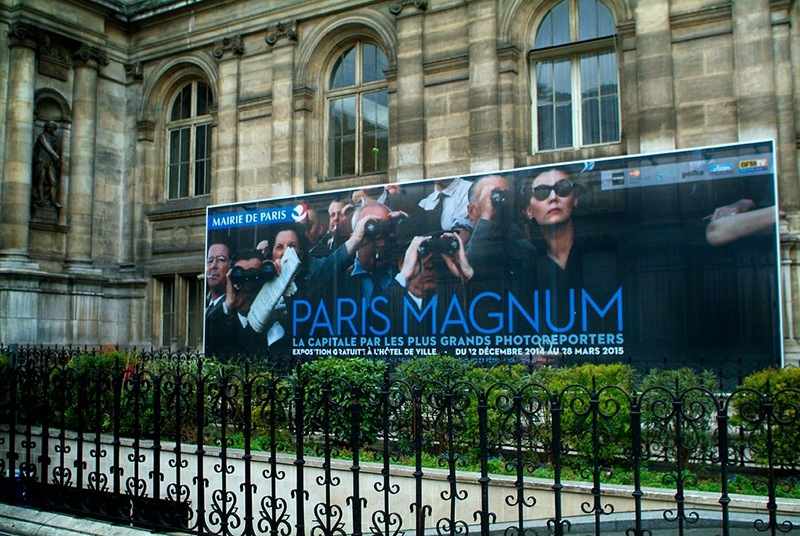 The Paris Magnum show was absolutely phenomenal, Edgar. It certainly merited its own post but unfortunately we weren't allowed to take any photographs inside - I think for security reasons since it was in the Town Hall. And trust me, this isn't even the tip of the tip of the iceberg...there is SO much more to see! A beautiful tale I could relate to all of the feelings you described. Lovely shots. That's what Paris is in my memory - a blur! But I'm so glad you were able to pay a quick visit and take in your favorite sights, plus 2 exhibits!! Is this your first time back as a photographer??? 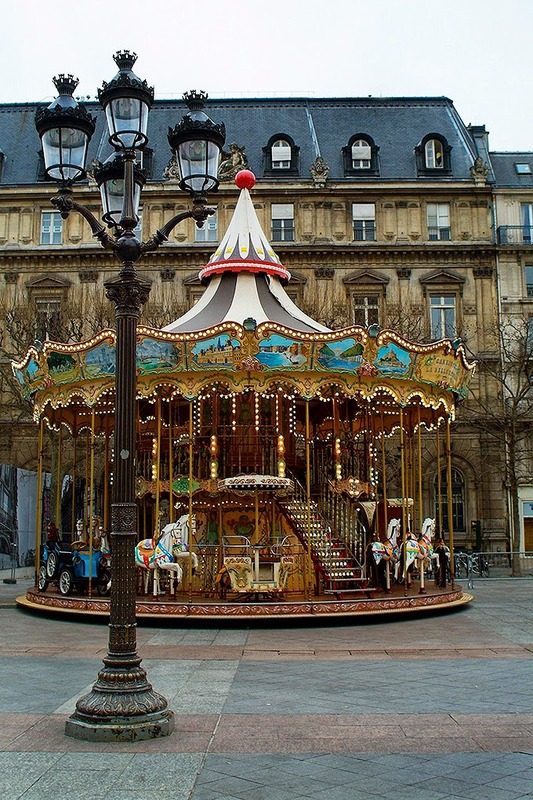 I loved the mix of black/white and color; loved the carousel, the people dancing. Now your fans are craving for you to go back - "more! more! ", the people cry! Thanks for the lovely, quick visit! Le sigh. I would so love for us to have a few days there together like we did oh so many years ago!! Love you Sister. Lovely Heather! You always make me feel at home with your descriptions. 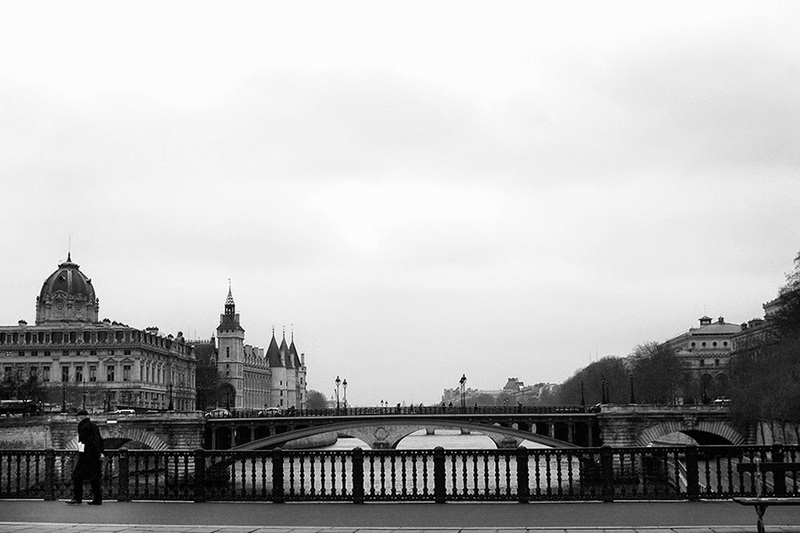 I love Paris and I miss it everywhere I go ... I was strolling on those places with you while reading and watching the photos and I felt the same pain when you left by train.... your thoughts were mine...(empathy) . Have a nice week end my dear! Emilia, I think that you are an empath. I am too but it is a phrase that I only learned of recently. I think it is a wonderful trait in you! Dear Heather, what a delightful account and though Paris is at the top of my list, I have yet to spend time there in spite of all my travels! Soon, very soon! I can see you striding through Paris, revisiting favourite places, and trying to catch a glimpse of perhaps something new. Hold it all in your heart Heather, until the next time. Beautifully put, Tracy. I will. You covered a great distance in such a short visit. All your images are beautiful. 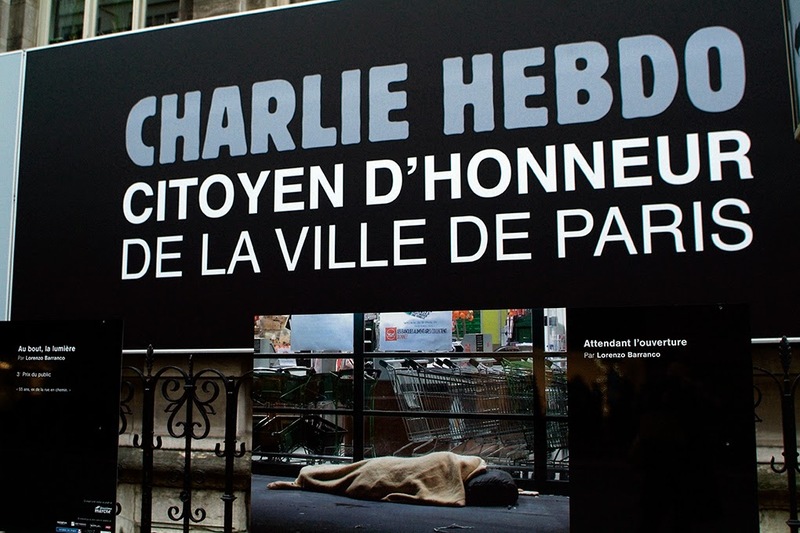 Paris is long overdue a visit from us. Helen, Paris would be such an enormous source of inspiration for your work that I bet that a visit there could be a tax write-off! And I sincerely hope that all of your hard work paid off! I'm loving your posts on Paris, as we are right now in our apt in St Germain des Pres, renting for a month. 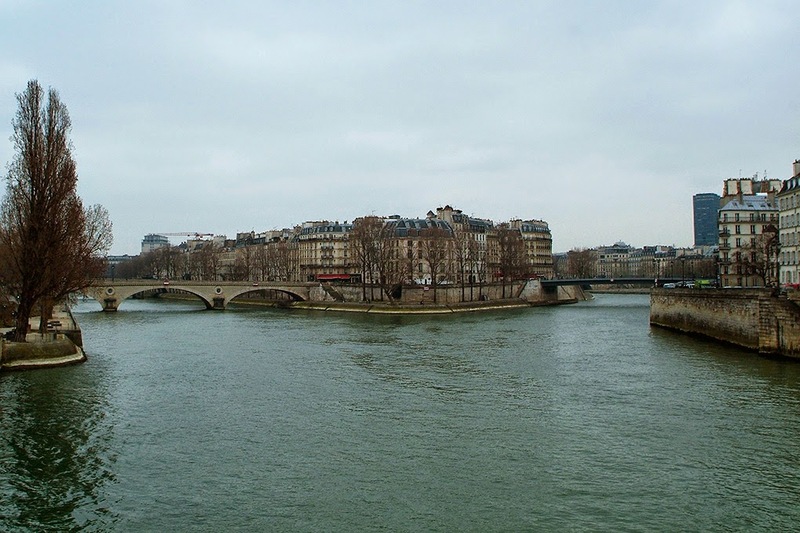 I have been by, in, near many of these beautiful places, and having a long time to really savor so much sweet Paris has to offer has been pure luxury. I even enjoy going grocery shopping at Carrefour - now is that a cookie or a biscuit or a cracker! Just try putting cheese and salami on a cookie - I know 'biscuit is a cookie, but it looked so much like a cracker!!! I could live here forever!! It feels 'right.!! I love your photos I admire you being able to select just a few for your post - that is always my challenge, I want to look at everyone of my pics and show them to everyone - they make me fall in love over and over, with this amazing city and just with life! Judi, your comment made me smile. Oh, I know all too well! When I first moved here I couldn't figure out why the clothes weren't getting clean in the wash...it was because I was buying fabric softener instead of detergent! :) While you are at Carrefour - and even better is the Monoprix that is not far from the Cafe des Deux Magots - look in the tapenade/spreads section (usually by the olives) for products from Jean Martin. They are from Provence and are really good - just not on a cookie! Also, don't forget to buy plenty of Fleur de Sel du Camargue - sea salt. It really is the best!! !